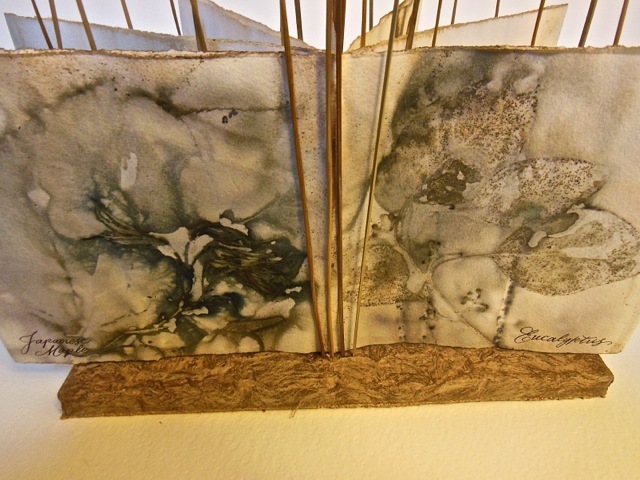 Dot's Rainbow: New Altered book for Marin Museum of Contemporary Art show. Visiting the San Francisco Center for the Book, I noticed how books and cards are displayed and how difficult it is if it is not on a pedestal to be able to be seen all around it and opened to see inside of it. I know this display piece I engineered doesn't solve anything more than a few pages of either, but I thought it could work a little. I wasn't sure about what to use as its base or the structures supports. Just checking through my stashes, I noticed the Mexican Amate paper that was left from a class of Jane Dill's and a piece of cork left from a bulletin board I had made. 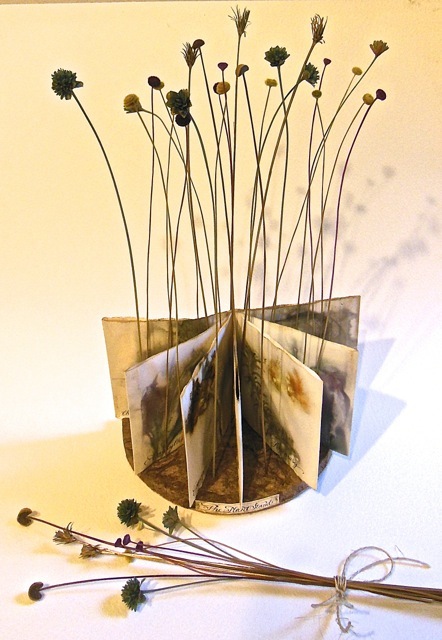 Then, in my storage, I notices the left over dried flowers from a previous work. Here are some photos of my procedures. I did many a sketch and thought about this a lot. The printed papers from my Eco-Printing were altered to make an accordian book. Everything is natural, even the nori glue to the walnut ink, cotton paper and real plants for printing and supports, the amate bark paper and cork base..
New Altered book for Marin Museum of Contemporary Art show. Visiting the San Francisco Center for the Book, I noticed how books and cards are displayed and how difficult it is if it is not on a pedestal to be able to be seen all around it and opened to see inside of it. I know this display piece I engineered doesn't solve anything more than a few pages of either, but I thought it could work a little. I wasn't sure about what to use as its base or the structures supports. Just checking through my stashes, I noticed the Mexican Amate paper that was left from a class of Jane Dill's and a piece of cork left from a bulletin board I had made. 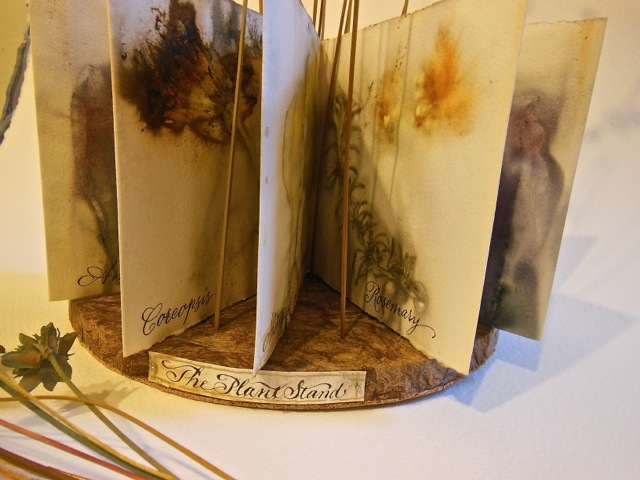 Then, in my storage, I notices the left over dried flowers from a previous work. Here are some photos of my procedures. I did many a sketch and thought about this a lot. The printed papers from my Eco-Printing were altered to make an accordian book. 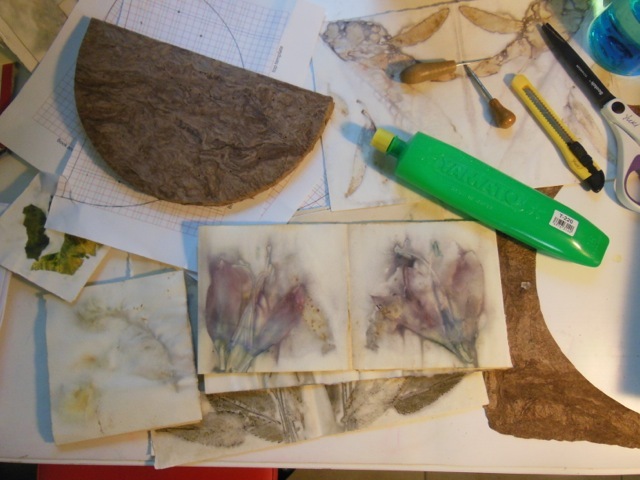 Everything is natural, even the nori glue to the walnut ink, cotton paper and real plants for printing and supports, the amate bark paper and cork base.. Here the base has been readied for the holes made by a awl. You can see the template below that I worked out on Illustrator. I also Eco-Printed the papers to make the accordian folded book. Here is the back of the piece supporting the book. The pages have already been scribed with walnut ink to identify the plant used in the printing. This view would show a front and back cover of a book. This is the front with the title of the piece, The Plant Stand. The finished piece. The dried flower stems can be easily removed..no glue holding them in place, A new card or book can be put in place and then stems can be replaced to hold up the card or book. I placed them strategically so more or less pages can be seen. Dorothy, I love your idea for a support structure for books! Sorry to have missed your class. I love doing the eco-printing and hope to do more.